Click to explore Partition witness accounts and migration routes. The 1947 Partition Archive records life stories shaped by Partition. Witnesses are waiting right now to share their incredible and historic memories. Will you donate now to help us reach one witness? This summer, join us to preserve history! Find information and APPLY HERE! A global digital museum accessible to everyone. Welcome to The 1947 Partition Archive. We are dedicated to documenting the people's history of the 1947 India-Pakistan Partition. Our flagship oral history project has helped preserve over 7,500 memories of Partition witnesses. Oral histories in the archive are widely distributed on social media and to universities across the world for access to researchers. Our work is not purely academic but is public history with humanitarian undertones. We are devoting our lives to serving witnesses and to creating a more empathetic world. We democratize historical documentation - We are a modern digital archive that is dedicated to documenting everyone's history. We continuously innovate techiques in crowdsourcing and other non-traditional methods that allow us to reach all segments of society, including those that are often 'left out' and don't fall under the radar of conventional studies. We empower people to document their own histories. You can think of The 1947 Partition Archive as a global digital museum accessible to everyone, everywhere, and built by everyone, everywhere. Preserving memories of Partition via CROWDSOURCING: The 1947 Partition Archive, "The Archive" has been preserving oral histories of Partition witnesses since 2010 through a combined program that includes an innovative technique for crowdsourcing by Citizen Historians, as well as collection by trained scholars. Over 7,500 oral histories have been preserved on digital video, making The Archive the largest documentation effort focused on Partition. Oral histories have been recorded from 400+ cities in 12 countries across the world. A tiny staff supported by interns work tirelessly behind the scenes to support the 110+ Story Scholars who are and have contributed oral histories, and over 550 Citizen Historian volunteers who have devoted an estimated 60,000 hours in volunteer labor towards recording stories. In addition to oral histories, The Archive also digitizes and preserves antiquated and current photographs of significance, family portraits, as well as objects of significance from the time of Partition. Over 30,000 photographs are preserved in this manner. Public education on Partition: Over 900,000 followers on Facebook and Twitter have shared witness stories - posted twice daily - 10's of millions of times, resulting in many reunions of old families and friends. The 1947 Partition Archive's effort to bring lived memories to the public also include hosting "Voices of Partition," witness storytelling events across the world, as well as curating audio visual traveling exhibits that bring stories to art and culture spaces. Turning the tide on public acceptance: The sharing of lived memories over social media, millions of time,s has helped create a "critical mass" acknowledgement of the human suffering that resulted from Partition. As a result, we are watching a change in tide of public constiousness. We are watching as memories of Partition are becoming accepted in the mainstream and drawning attention from popular film makers, media makers, news organizations and educators. An honest look at our past, with scrutiny will help us move toward a more just future. How you can help: The Archive is truly a labor of love, built for people, by people from diverse backgrounds. You too can join us. Learn how to record and share a story from your community now! Or support another story through your donation. Online access to oral histories in The 1947 Partition Archive has begun via the Stanford University Digital Repository! 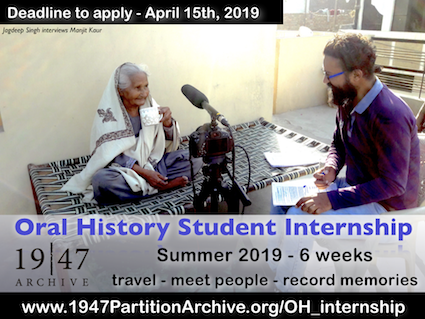 The 1947 Partition Archive is excited to partner with a consortium of universities to make the complete oral history collection available and accessible to the public. Fifty (50) oral history interviews from The 1947 Partition Archive's complete collection are now accessible via online streaming from Stanford University Library's Digital Repository at this Spotlight Exhibition. The complete collection will be released as funding becomes available. Please contact us if you would like to donate to this effort. Video: Kazi Shamsuzzaman migrated from West to East Bengal (full interview coming soon). Video: Ajit Cour migrated from West to East Punjab (full interview coming soon).